On Bourbon Street sits a quiet and unassuming building. Not only is it one of the oldest buildings in the French Quarter, it is also one of the most haunted. Lafitte’s Blacksmith Shop has a long haunted history. For years, there have been reports of ghosts, even what is possibly the ghost of Jean Lafitte, haunting this building which is now a bar. Lafitte’s Blacksmith Shop gets its name from Jean Lafitte, who was a pirate and privateer who called New Orleans home in the early 1800’s. A pirate and a privateer were essentially the same thing. A pirate worked for themselves while a privateer worked for a Government. They both looted and robbed and killed. One was just socially acceptable, the other was not. Lafitte is believed to have been born either in France or the French colony of Saint-Domingue. By 1805, he operated a warehouse in New Orleans to help disperse the goods smuggled by his brother Pierre Lafitte. After the United States government passed the Embargo Act of 1807, the Lafittes moved their operations to an island in Barataria Bay, Louisiana. By 1810, their new port was very successful; the Lafittes pursued a successful smuggling operation and also started to engage in piracy. Lafitte became a local legend during the War of 1812 when he helped Andrew Jackson defend the city of New Orleans from capture at the hands of the British. Today, you’ll see many landmarks and buildings with his name in New Orleans. 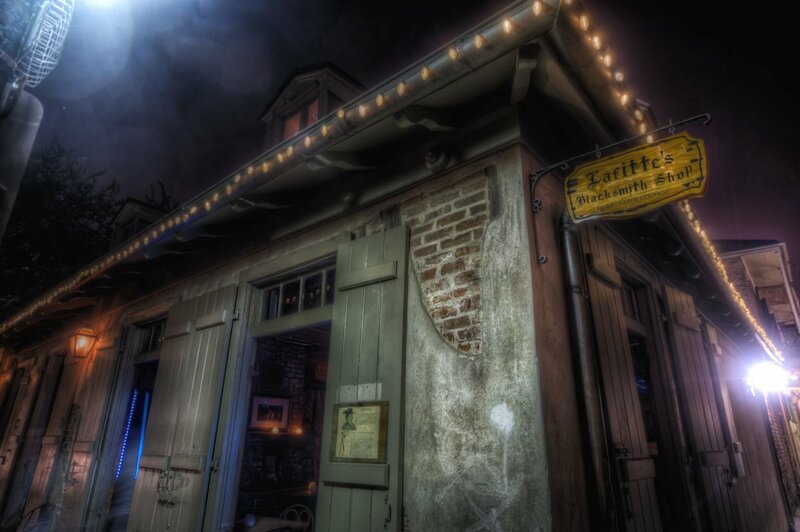 When it comes to the ghosts and hauntings at Lafitte’s it comes as no surprise that the ghost most often associated with this building is the ghost of Jean Lafitte himself. Interestingly, he appears as a full bodied apparition. Full bodied apparitions are not as common as movies would make them out to be. Most of the time, ghosts are often seen as a mist, sometimes even a shadow person. A full bodied apparition would appear no different to you than a living person…except in this case our ghost is dressed in sailor’s gear. The ghost of Jean Lafitte has never interacted with anyone. He has never said a word to anyone. He simply stands in the dark corners, staring at people until he is noticed, at which time his ghost disappears into the shadows. Now, this hasn’t happened just one of two times. It seems to be a fairly common occurrence here at the Blacksmith Shop. He is always seen on the first floor, most of the time near the fireplace that is inside. On the second floor of Lafitte’s Blacksmith Shop there seems to be another ghost which calls the bar home. Nobody knows who this ghost is, we only know that it is the ghost of a woman. It could have been someone who lived here. Rumor has it that there was a woman who lived here in the 1890s who killed herself upstairs. We cannot find any verifiable sources on this, but it is entirely possible. This ghost is a little more mysterious. She has only shown herself to people on a handful of occasions. However, she is very talkative. Imagine sitting in one of the rooms upstairs, by yourself, late at night..and hearing a woman whisper your name into your ear. Yeah, if that doesn’t send shivers up your spine not much will. But that is what she likes to do. She probably just wants to let you know she is there, that she knows who you are…not realizing that by doing so she has probably made a few people have a panic attack! Now, aside from ghosts, there is another phenomenon which is often associated with Lafitte’s Blacksmith Shop. Who has ever heard of phantom red eyes? Well, we have something here which is often seen that has bright red eyes. There is never a body, never a voice….just piercing red eyes. They are always seen in the dark corners of Lafitte’s. As soon as you make eye contact with it, the eyes will freeze on you, before fading into nothing. Ghosts don’t have red eyes. People have an unfortunate habit of lumping everything paranormal into the category of ‘ghost’. This isn’t the case. Red eyes are a phenomenon reserved for demonic hauntings. At Ghost City Tours, we hold ghost hunting events all over the country where people can join us on real paranormal investigations. Tim, the founder of Ghost City, runs all of these events and is a very experienced paranormal investigator. If you had a chance to meet with him and talk ghosts I highly suggest asking him about his experiences with demonic hauntings. They are not for the faint of heart. Do you want to learn even more about Lafitte’s Blacksmith Shop and the ghosts which haunt it? Nightly, at 8 pm, you can join us on the Ghosts of New Orleans Tour. We’ll make a stop at Lafitte’s Blacksmith Shop to share the haunted history of this mysterious location. We’ll even give you time to go inside and grab yourself a drink from the bar. Do you want to tour Lafitte's Blacksmith Shop? Our New Orleans Haunted Pub Crawl visits Lafitte's Blacksmith Shop on a nightly basis, starting at 8 pm. You'll hear the whole story about Lafitte's and Jean Lafitte, the bar's namesake. For more information about all of our ghost tours in New Orleans, just click the link, or call our office at 888-859-5375.